Scorched Earth images of Marsden Moor – close to Saddleworth – look horribly familiar. In June 2018, a fire on moorland in that area took hold and burned for weeks; the army was called in, carbon-storing peatland and entire ecosystems were incinerated. But that was during a memorably hot, dry summer. We are now witnessing the strange spectacle of large winter wildfires. Separate fires broke out on Tuesday, too – two in Ashdown Forest in East Sussex, the woodland made famous in AA Milne’s Winnie the Pooh stories. 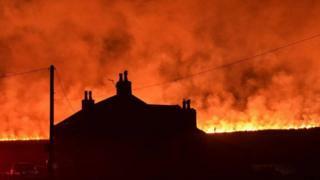 In Scotland, fire-fighters battled through the night to extinguish a large gorse fire on Arthur’s Seat in Edinburgh . And in Glyndyfrdwy, north Wales, a man had to be rescued from his tractor when it was cut off by the flames of a hillside gorse fire. So what is happening? In a changing climate, is this the new normal? Woodland fires in the UK are unusual, but fires on moorland – even at this time of year – are actually fairly typical. “This is the ‘muirburn’ season,” Dr Thomas Smith, an environmental geography researcher from the London School of Economics, explained. “That’s when Natural England permit fires on moorlands, before a ban on burning around mid-April. Those burns are part of the management of moorland – particularly when it is used for grouse shooting. Grouse prefer a habitat where heather is not overgrown, and burning small areas removes older growth and allows plants to regenerate and new shoots to come through. Land managers and fire services often work closely together to ensure conditions are right for controlled burns. “Looking at the satellite image for Tuesday (26 February), there were plenty of well managed fires burning across Northumberland and Highland moor sites,” said Dr Smith. But there is an important distinction to be made between controlled burns and large wildfires that crews have been battling around the country – fires that scientists say we may see more of in the future. 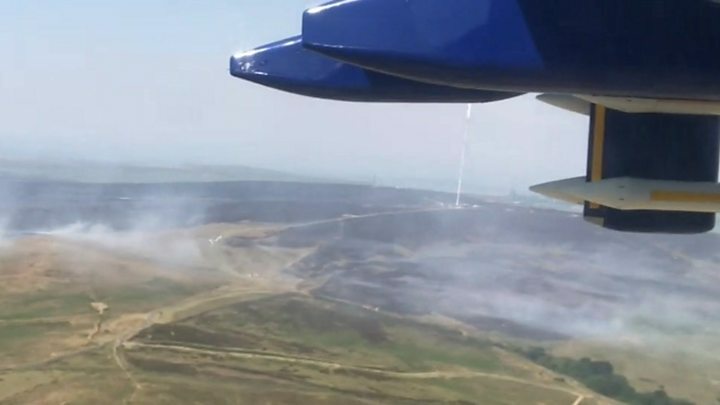 The scale of the West Yorkshire moorland fire, the cause of which is not yet known, has been driven in part by a favourite British talking point – the weather. Sunny, dry conditions created a tinderbox effect that we usually see in the spring. Prof David Demeritt from Kings College London explained: “It’s unseasonable. “Landscape fires in Britain happen disproportionately in the Spring, because on the moors and in the forest, you have no leaf cover. Is climate change driving that shift? Prof Demeritt agreed. “This is consistent with what we might expect in the future, but attributing one particular warm weather event to climate change is tricky. The good news about the fires, according to Dr Smith, is that they will probably not cause significant ecological damage. Because soil is wetter at this time of year – despite well below average rainfall in January and February – their spread will be limited. What do these fires mean for air pollution? We are unlikely to see big casualties from wildfires in the UK, like you do see in Australia, California and the Mediterranean. “Here, the fires are smaller in extent and intensity,” explained Dr Demeritt.